Sending Jay and Ian huge congratulations on their wedding! They were married on Saturday 29th July at the lovely Roslin Beach Hotel, Southend-on-Sea. Their wedding cake was so vintage, really pretty and girlie (right up my street as my Nan would’ve said!) so I was really looking forward to making it. 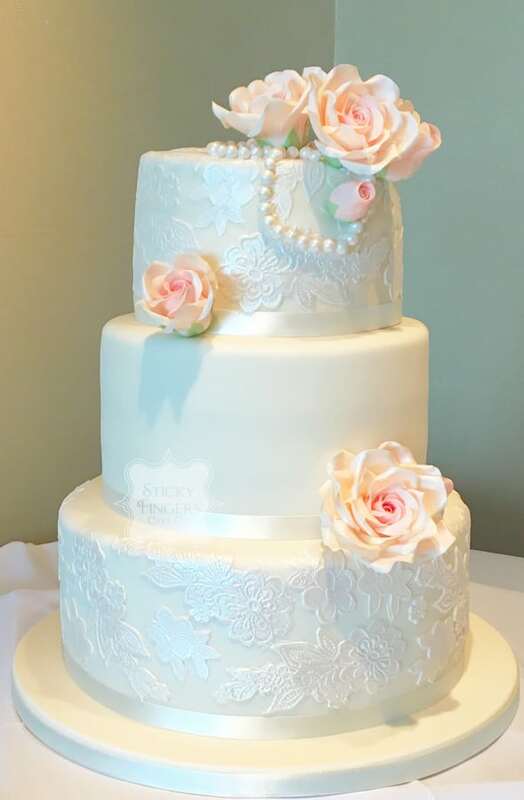 Two of the tiers had sugar lace with a plain middle tier and finished off with pale pink sugar roses and draped sugar pearls. Jay is a massive fruitcake and marzipan fan so their bottom tier was our brandy soaked fruitcake with an extra thick layer of marzipan, then Black Forest cake and finally cherry Bakewell on top. Loved this cake so much!